Welcome to Horley Team Ministry Website. Our three churches are, St Bartholomew’s, St Wilfrid’s and St Francis’. 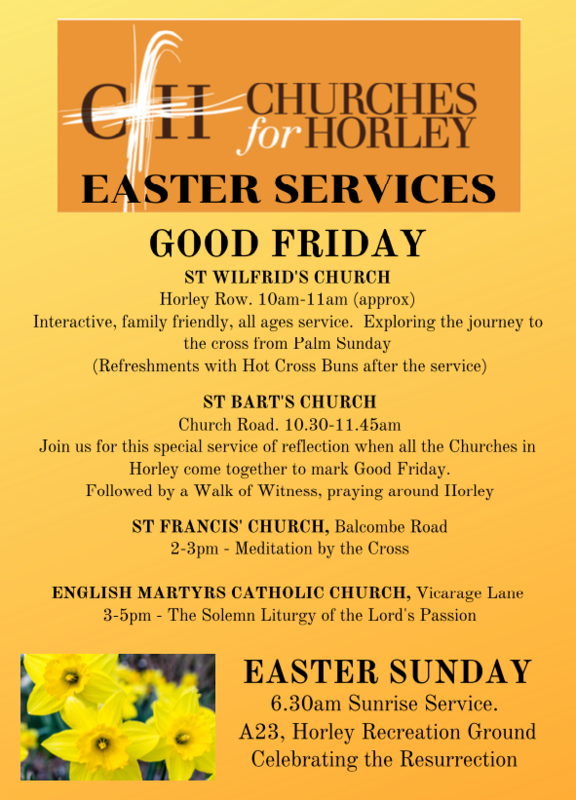 The three churches work together in serving the Parish of Horley, within the Deanery of Reigate and in the Diocese of Southwark as part of the Church of England. Our mission statement is “Serving Horley With The Love of Christ”. We hope to live this out in various ways. The three churches are different in their styles of worship as we recognise God is a God of variety and diversity in worship style. We look to God through the scriptures and are guided by the Holy Spirit to help, inspire and enable us to remain faithful to this mission of God in Christ to the local community and beyond. The Parish is an Evangelical parish with a mix of traditions in both styles and worship within the Anglican Communion. We believe that the Bible is the word of God and should be seen in our every day lives, to inspire, nurture and to encourage people to know that they are loved by God in Jesus and through the Holy Spirit. Please explore our website if you would like to find out some more about us. You would be most welcome to join us for worship at any of the three Churches at any of our services. For all the news in the Parish see the News tab.